The Signal comes from across the pond with some excellent word-of-mouth. A head-scratching, slow burning sci-fi rather than one concerned with explosions or green goo, it has certainly made an impact when it has been shown across this year’s festival circuit. Is it worthy of all the fuss bewstowed upon it? Well yes and no. 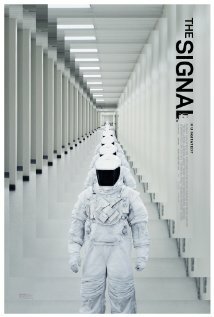 A strange fable, The Signal sees three friends, Nic (Brenton Thwaites), Haley (Olivia Cooke) and Jonah (Beau Knapp) heading across the US to help move Haley to pastures new. Her boyfriend Nic, a former runner, is struggling to cope with his leg injuries (with the explanation hinted at rather than fully explained), and breaks Haley’s heart. Alongside their travels, Nic and Jonah are computer whizzes, and hackers, who have stumbled upon a strange signal from a source known as Nomad. Teasing the guys with threatening spam emails, they are determined to find Nomad and bring his internet games to an end, using the trip to track him down once and for all. After some thought and time has passed since the screening, its fair to say that The Signal while great in places, never reaches greatness in the way that maybe over time it will be enamored with. It shows some great flashes of brilliance from both the director, William Eubank, through the production team and visual effects wizards, but it just lacking that magic touch to take it from good to excellent. That said, it has all the hallmarks of a great cult sci-fi film in waiting: the aforementioned special effects are superb in places, utilising both the landscape the otherworldly feel, as well as giving some wonderful slo-mo digital treats. All of that, combined with Eubank’s sharp eye and tension-building shots, really give the film a solid backbone. Where it lets itself down is in it's pacing. The scope of the script is huge, and has some truly grand ideas incased in it, it doesn’t quite work across its somewhat overlong runtime. That’s not to say the film is a bore or not worth your time or money because it is, but its intrigue and genuine edge-of-your-seat moments are a little off balance in places. Indeed, the end pay-off while bold, does bring more head-scratching that definitive conclusions, and leaves you feeling more empty than wholly satisfied about where it eventually concludes. Also noteworthy are the leads, who impress. Brenton Thwaites is slowly making a big name for himself, with his earlier turns in the excellent Oculus, ably. supported by Beau Knapp and Olivia Cooke, the trifecta of young talent work well together (even if Cooke is left a little short-changed). And of course, there is Laurence Fishburne, a burly, calming presence as always, giving the film added class and integrity. There are some minor shades of Morpheus here, but the veteran actor excels as the shady stranger Damon. In many ways, The Signal is this year’s most impressive indie sci-fi film, full of wonderful imagery and an original take on the genre. Directed with gusto by William Eubank, who certainly has a genuine talent, it will certainly keep you guessing and pondering throughout. That said, the mid-section sags somewhat, and just when you think its heading one way, its deviates into something a little underwhelming. You can follow Scott Davis on Twitter @sjdavis1982.